Below you will find a list of useful drug education resources. You can filter these according to your needs using the filters on the left hand side. See Getting Started for more information about how to use this site. By default results that have the highest evidence rating, and are Australia-based, are displayed first. Video demonstration shows how parents can communicate effectively with teenagers about alcohol use. Webinar - Parties, gatherings and sleepovers: How can parents keep their teens safe? The Emergency+ app uses GPS to help a Triple Zero (000) caller provide critical location details to emergency services. Be prepared for the unpredictable nature of drugs: Learn what to look for and how to help in a drug-related emergency. This factsheet provides advice for parents to help keep their teenagers safe when they attend parties or events. This factsheet provides advice for parents whose teenagers are attending school leavers' celebrations. For you or someone you know. We would like to acknowledge the traditional owners of this country and pay our respects to Elders past, present and emerging. Positive Choices is committed to embracing diversity and eliminating all forms of discrimination in the provision of health services. 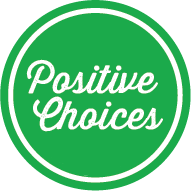 Positive Choices welcomes all people irrespective of ethnicity, lifestyle choice, faith, sexual orientation and gender identity.